Manage web-based seminars and training sessions: flexibly, across all locations and available at all times. rexx Seminar Management provides you with an up-to-date overview of all advanced training sessions of your specialist and management staff, including the costs and the dates. Moreover, the software takes over time-intensive administrative tasks for you, allowing you to concentrate on the most important thing – the content that can benefit your specialist and management staff. With rexx Seminar Management, plan all your company’s education courses and advanced training and training sessions, easily and conveniently. You will always have a good overview of all planned events, their status and the number of participants in the event list. 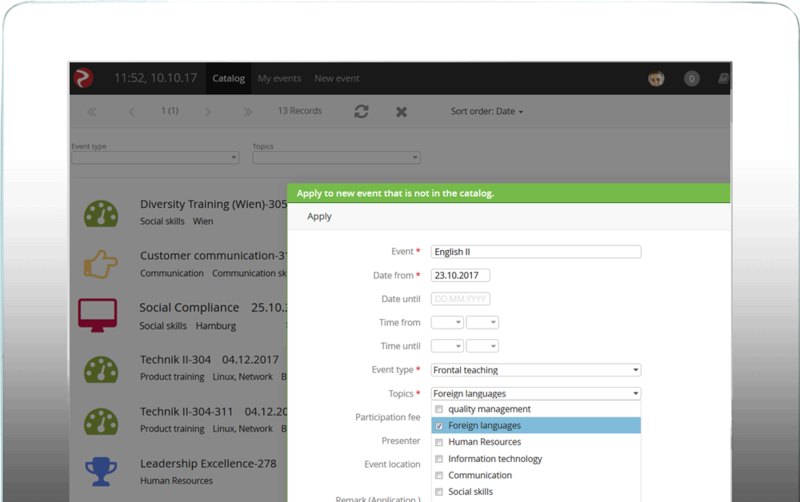 With just one click, you can publish an event in the employee portal or change to the digital event file. An employee can make an application to participate in a training session through the self-service portal at any time. The required approval can be obtained through the defined workflow process. 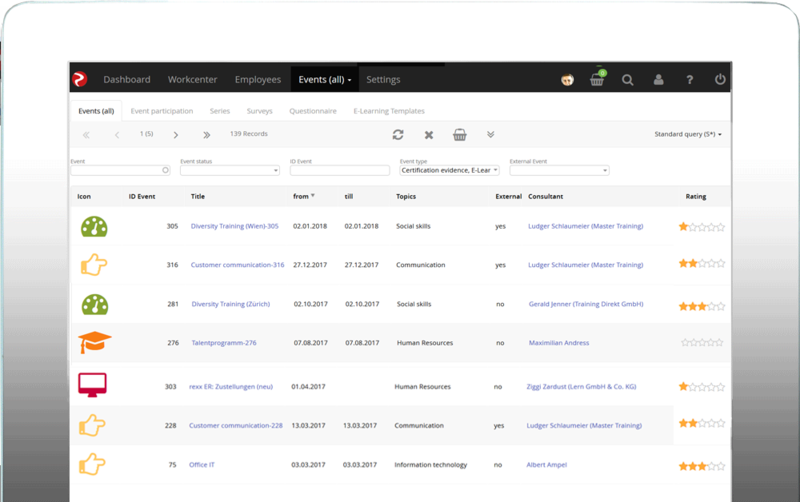 At the same time, the employee can automatically monitor their allocated training budget. 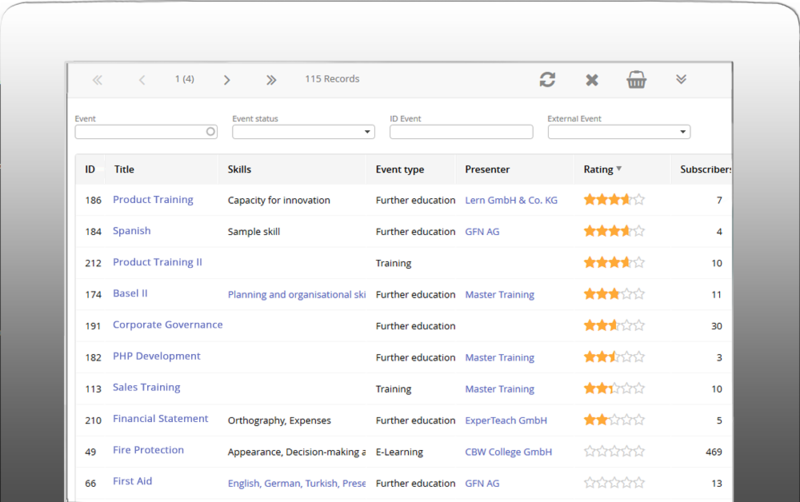 Manage all your seminar providers and references directly within the software. You can easily add your employees as internal speakers as well as external speakers. Easily manage all relevant information in the digital events file, the heart of the software. You can enter details of the event and then publish it in the employee portal for independent booking by self-service. All participating employees have access to the same information at the same time and without any further effort. You are able to directly identify which employees already plan to participate or you can manually add other employees to the event. When somebody new is invited or someone confirms their participation, you can change the status of this person in the event list with just one click of the mouse. Find the right employee with the skills you need for every project.